Pre Vizsla: “The transition of power will be seamless. We now have the support of the people and Satine to bait Kenobi. With his demise, our deal will be complete. 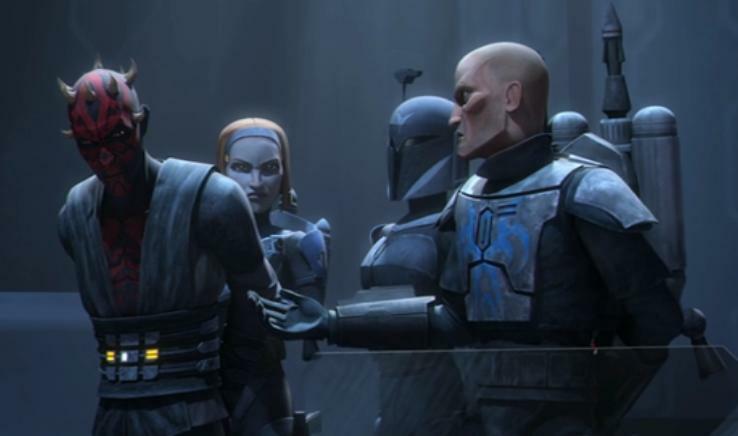 However, Pre Vizsla does not have the same grand plans as Darth Maul does, which makes sense, since he has, all along only desired control of Mandalore. Pre Vizsla then tells Darth Maul, from whom he is sick of taking orders, “Your vision no longer matters.” He has him promptly arrested (seemingly having arranged to do so with other Death Watch members previously). He then finishes off by saying, “Oh, don’t fret. I’ll still honor our deal. Kenobi will be dealt with. But now you’ll do as I say.” Clearly, Pre Vizsla is very much enjoying having the upper hand in their dealings, as well as having achieved what he wanted – control of Mandalore. Darth Maul is then imprisoned alongside his brother, Savage Oppress.